An Austin police officer filmed pepper-spraying a handcuffed man during his arrest downtown in March was suspended for 45 days on Tuesday, city officials said. Officer Cameron Caldwell (pictured above on right) could also face criminal charges for the March 17 incident in which he was caught on camera by a Peaceful Streets Project activist using pepper spray on an arrested man in the back of a police van. On Tuesday, the Travis County district attorney’s office confirmed that a grand jury will review the incident. 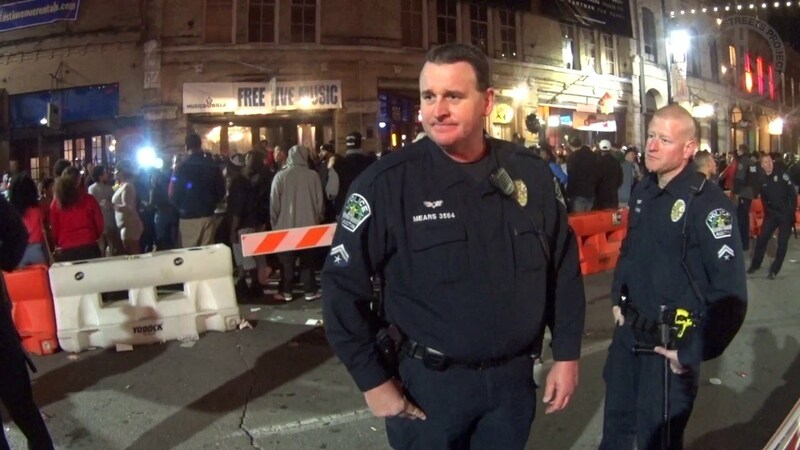 The March 17 incident happened in downtown Austin during South by Southwest. The video, which garnered wide media attention, shows Caldwell interacting with Tyrone Wilson, who had been arrested and placed inside an Austin police van near the downtown booking area at Seventh and Neches streets. Wilson kicked the door of the van multiple times and continued to do so after Caldwell ordered him several times to stop, Caldwell’s disciplinary memo said. After Wilson disobeyed him again, Caldwell opened the door, sprayed Wilson in the face with pepper spray and shut the door. Wilson was handcuffed and seated at the time. During a disciplinary hearing earlier with Acevedo and Caldwell’s chain of command, Caldwell admitted to wrongdoing. Caldwell has no previous history of improper behavior, which Acevedo said contributed to his decision not to fire Caldwell. The suspension was a negotiated agreement with Acevedo: Caldwell waived his ability to appeal the suspension, and Acevedo agreed to not fire Caldwell. The suspension places several other conditions on Caldwell, including requiring him to be evaluated by a police psychologist and to have a one-year probationary period. He also could face additional disciplinary action if indicted, the memo says. Failure to meet any of the requirements would result in his termination. Buehler said that Caldwell should be fired and charged with assault. Caldwell’s disciplinary memo states that he violated guidelines on the use of pepper spray and general conduct. He won’t be paid during the suspension and will return to duty Oct. 14. He has been with the Austin police for three years, police said. Wilson has a court hearing for a charge of resisting arrest scheduled for Nov. 14.